Enabling Open Scholarship (EOS), partner of the PASTEUR Project, have developed a set of data visualization tools which allow an overview of how aligned Open Access policies across the world are to thirteen of the requirements of the Horizon 2020 funding program. 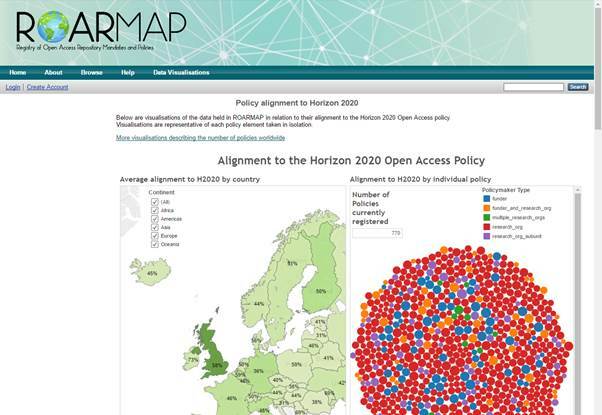 The visualisations use data taken from the ROARMAP database to provide a view of the average alignment of each country’s total number of policies is to H2020. They also show how aligned individual policies are to the H2020 requirements on an element by element basis. The visualisations take the form of maps, bubble charts and bar charts and are all fully interactive. It is possible to select which type of policymaker you are interested in viewing, and then only see information related to that type. 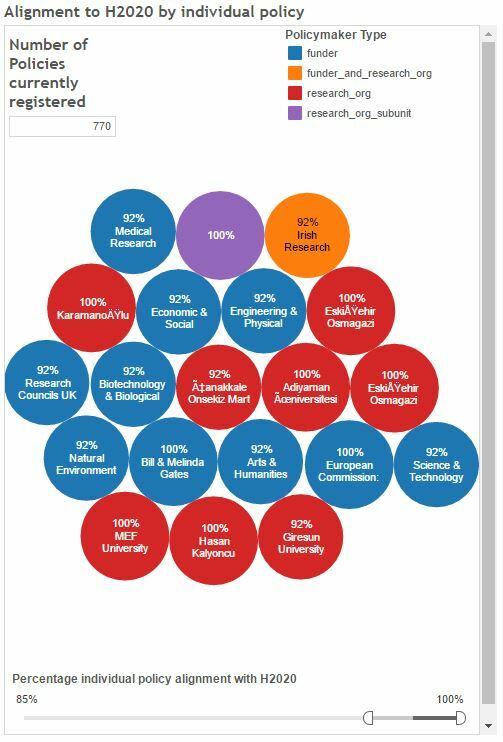 Equally, users may wish to only see which policies are highly aligned to the requirements of the H2020 policy, and can use the interactive sliders to obtain this information from the visualisations. 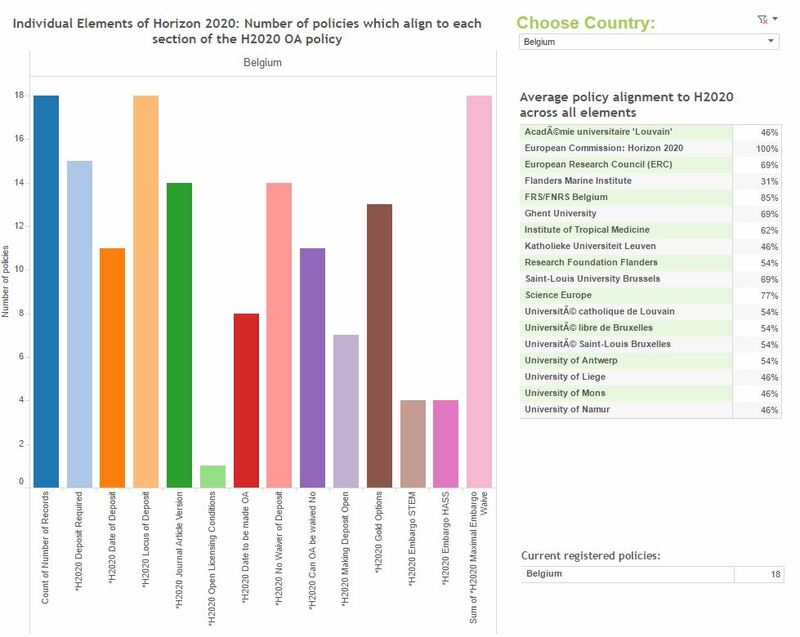 Each policy was assessed against thirteen criteria found in the H2020 policy and then this was broken down to provide a bar chart giving an overview of how each country is fairing in terms of their overall alignment to the requirements. In the example below you can see that overall Belgian policies have a high alignment to H2020 on most elements, however the issue of licensing conditions remains unaddressed in many circumstances. The dropdown menu allows users to select any country which has a policy registered in ROARMAP and get an overview of how that country’s policies are fairing. Image 3: Interactive chart showing number of policies per country as well as alignment across individual policy elements. Visualisations were created using the free downloadable software Tableau Public. Data were extracted from ROARMAP in JSON format before being converted to CSV format using an online tool and then loaded into the software and manipulated. This approach was to enable future updates to be carried out quickly and efficiently, and with a view that in the future live-updates could be easily executable using a web data connector tool.